1. Prepare sauce: Whisk sauce ingredients in a bowl until combined. Chill until ready to use. 2. Prepare salmon: Preheat the grill and spray the hot grill rack with nonstick cooking spray. Grill the salmon over hot coals for 2 minutes per side, turning to make diamond or square grill marks for presentation. Remove the salmon to a platter and cover to keep warm. 3. Prepare spinach: Heat wine in a large sauté pan over medium-low heat. Sauté the garlic in hot wine for 1 minute. Add the spinach to the garlic mixture and sauté just until the spinach turns bright green and wilts. (If the garlic sticks to the pan, add 1 to 2 Tablespoons vegetable broth or water). Sprinkle the spinach with nutmeg and pepper. 4. To serve: Pat the spinach dry and portion evenly on 4 heated plates. 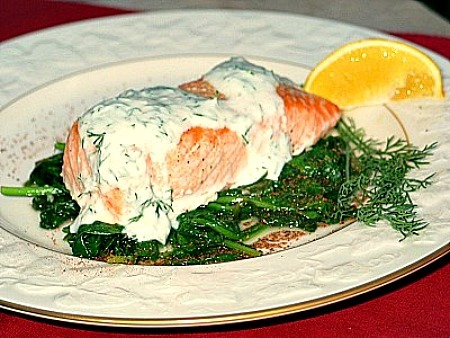 Arrange salmon so as to partially cover the spinach and drizzle with the sauce. 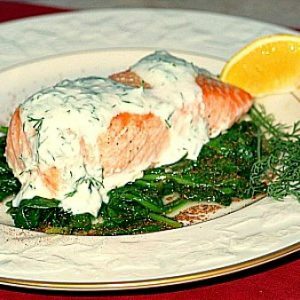 Garnish each plate with 1 sprig of dill weed and 1 lemon wedge. *For perfectly cooked fish every time, measure the thickest part of the cut and cook, any way, for 10 minutes per inch of thickness.